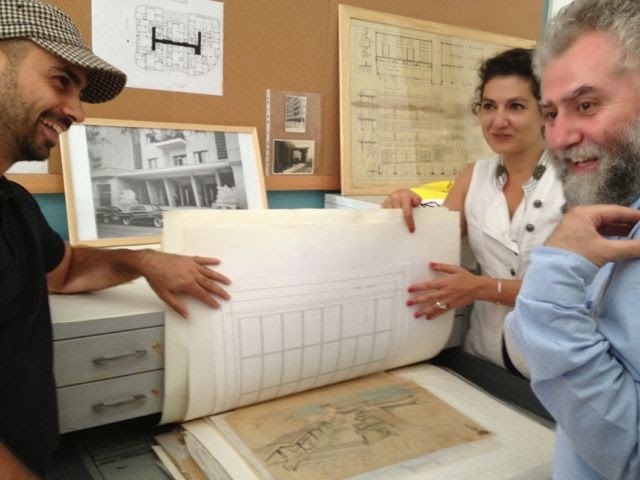 We had a blast at last year’s International Archives Day with Professor George Arbid at the Arab Center for Architecture. This year there are three packed days with 17 archival institutions in Lebanon opening their doors to the public and offering rare tours. It’s definitely worth the trip and a great way to support local archiving and public access to it. ACA will display a small exhibition on the theme: “Items of an Archive of Modern Architecture”, showing the various items that are found in an architectural collection from drawings to photographs, models, books, etc. Guided visits to the center will also be proposed. AMAR’s archives of 7,000 records, principally from the “Nahda” era (1903 – 1930s) will be on display along with the various music playing equipment of that era like Gramophone and Edison cylinder player (1890). Visitors will be introduced to the process of sound restoration and digitizing as well as aspects of music archiving. They will also listen to samples of recordings from the archives. On the occasion of International Archives Day in Lebanon, the Arab Image Foundation will be showing a selection of photographs from “Portraits du Caire”. This exhibition and accompanying publication present the work of three Armenian photographers – Alban, Armand and Van Leo – considered as masters of Studio Portraiture in Cairo in the forties and fifties. They worked in the commercial sector on commissioned studio portraits. While their work reflects each photographer’s individuality, it shares similar concerns for the craft of photography. Their photographs bear witness to the infiltration of modernity into Cairo’s society, during an essential period of its history. June 9th, 2:00 pm – 5:00 pm. Annahar Center opens his doors giving the visitors an opportunity to learn more about the important role played by the organization to understand the past, present and future. – Manuscripts from our archives, e.g. notebooks by Jirji Zaydan and Daniel Bliss. The Bibliothèque Orientale opens his doors for a guided tour around the reading room and a display of rare holdings and items from the past century (books, reviews, manuscripts, photographs and maps). Presentation around the different collections and Daralhayat publications during the last 25 years, together with a glimpse of the history and evolution of Alhayat newspaper as a national Lebanese local newspaper in 1946 to become the 1st Pan Arab newspaper in the world since its relaunch in London in 1988. Visitors will have hands on different archival databases with a briefing on the different services available at the center. All collections are in digital form. However, printed samples of different publications will be on display for reference. The Gate will be presenting it’s film restoration department: explaining about the projects and films that have been saved, showing the process of restoration from the films reception, manual cleaning until the digitizing process. Screening parts of Shattered Memories, a 26 minutes documentary by Lara Saba, from the archives of Tele Liban, made by the Gate in collaboration with Fondation Liban Cinema. This year, The Fouad Debbas Collection (TFDC) will focus on the figure of Fouad Debbas, collector and pioneer in the understanding of our common history and heritage in Lebanon. Will be presented samples of this collection from the 1830s to the 1960s: photographic materials, engravings and also newspapers. Tours in the digitization lab or in the archive room will be organized by appointment only. The Institute for Palestine Studies will expose private papers, photographs, microfilms and posters from its major collections. The majority of the archives will cover the most significant period in the modern history of Palestine from the 1900s until 1967. On the occasion of the International Archives Day, the Revival Project of the Lebanese National Library offers the public an opportunity to discover its workshops and treasures. Exhibition of different Lebanese topics: Emigrants; Books with special covers; Detective fiction; The memory of the Library and its librarians; The beginning of the Lebanese press; Rare and old books; Maps and plans. June 9th, 11:00 AM – 5:00 PM. By appointment only – June 9th, 1:00 PM – 6:00 PM. On display will be contact sheet albums starting 1993 to more recent years, along with a comprehensive collection of pre-war Beirut downtown prints. The contact sheets trace the step-by-step story of the reconstruction of Beirut’s Central District. June 7th, 9:00 AM – 1:00 PM / June 9th, 9:00 AM – 5:00 PM. UMAM Documentation and Research will be offering a guided tour of its archival fonds and a presentation of its web-based Memory at Work database initiative. In addition, you are cordially invited to visit “Baalbeck Studios @ The Hangar,” a limited-duration exhibition.